Five Rivers Environmental Contracting Limited, based outside Salisbury, are focussed on nature conservation and habitat creation, restoration and management. They have been carrying out environmental consulting and contracting works for the last twenty years and specialise in working on sites with specific constraints. The majority of their work is carried out in restricted sites of special scientific interest (SSSI) meaning that they are heavily invested in ecological best practice. The new website needed to display the wide range of services Five Rivers offers, to showcase their work and reflect the size and scope of the company. In the years since their original website was built, Five Rivers have grown and become more diverse, so needed a website that could not only reflect this, but continue to grow and diversify with them. The design and layout needed to be fresh and contemporary whilst retaining the company’s brand personality. The client needed to be able to update the site on a regular basis and maintain a news and social media feed. We designed and built the website giving focus to Five Rivers Environmental Contracting’s impressive portfolio, with write-ups, photographs, data and maps. Leveraging the power of WordPress’s custom fields and post types, we designed a website that could accommodate case studies and a range of services as well as giving Five Rivers the ability to add and edit the entirety of the site’s content. We hired a photographer to provide new imagery and staff shots and linked the design closely to existing marketing materials that we have provided over the years. 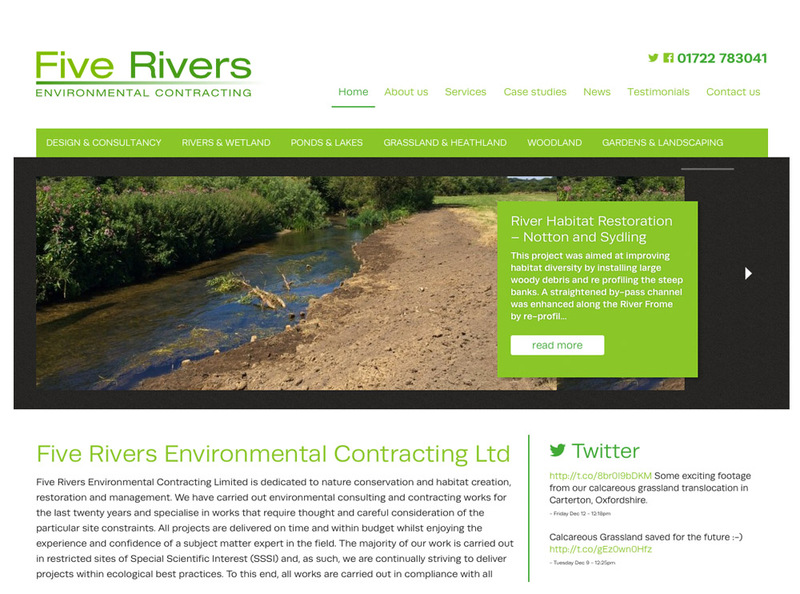 Five Rivers sought to refresh their website in 2014 in order to demonstrate their capabilities to the Environmental Community and beyond. The new site was required to clarify the diversity of works that Five Rivers has delivered over the last 8 years since the launch of the previous website. The significant challenge faced was addressing the range of works now undertaken by Five Rivers whilst providing an informative yet clear and user-friendly website. Addison Design was tasked with providing a website that appealed to both the professional and private sector and encouraging interest from the professional ecological sector down to private Riparian Clients with smaller scale requirements. Five Rivers is delighted with their new website and look forward to continuing their professional relationship with Addison’s in the future.